Blend the chips and cherries until equally mixed throughout the dough. Cover the dough and place in the fridge for one hour. Once the dough has had a chance to chill, take it out of the fridge and roll the dough into medium sized balls – if you have a cookie scoop, use it at this time. Place the cookies on a cookie sheet covered in parchment paper, giving them enough room to spread. Place in oven for 6-7 minutes. 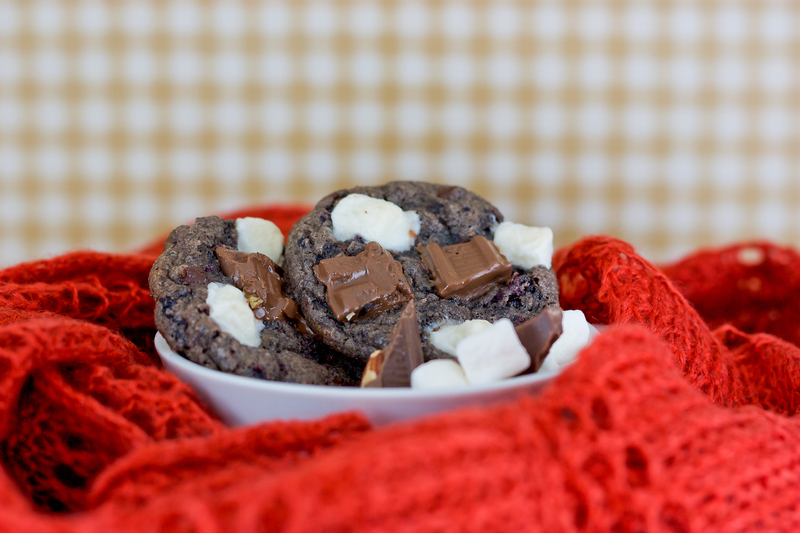 Take out of the oven and gently press in your marshmallows and hershey bar chunks (I did three-four mini marshmallows and 2-4 chunks of hershey bar in each cookie). After making the cookies into mini black forest cakes, place back into the over for another 2-3 minutes. You also have the option of quickly turning the oven to broil to brown the marshmallows. Place the cookies on a cooling rack after they have had a chance to cool on the cookie sheet for about 5 minutes. These cookies seem to take a bit extra time to cool off. Enjoy these tasty little monsters!